What did you all think about the not oft-used transport mode called "Jetting"? It seemed weird and somewhat pointless to me. I'm left wondering what the point was, unless it was made up solely to further pad out the Ninja Encounter three-parter. But it didn't even do that very well. Did the writer's have some other ideas in mind for it? I think they used it arbitrarily in one other episode before it faded into MMPR obscurity. Maybe it was one of those things that sounded better on paper than it actually turned out? It literally made no sense. When it was introduced, Alpha stated that the advantage of it was that it allowed them to see exactly where they were going. Problem is, until then we didn't know that they couldn't do this while teleporting. Disregarding the fact that we saw them hold a full conversation while teleporting in "Teamwork" (indicating that they remain in a conscious state), in almost every episode they would just morph directly to the danger anyhow. The only time it made a semblance of sense was in "Forever Friends" when it gives Bulk and Skull the idea to chase them in their own rocket packs. I guess its important to remember that this was during a really tumultuous time of MMPR's production and maybe the writers were just flyin' by the seat of their pants to get shows produced. They thought it would be interesting and that they could sell toys with it. Can't sell a teleporting toy, but one that just flies around? Any toy can Jet. Eh I wouldn't have thought it was so dumb if they didn't already have teleportation or the Radbug. It worked for the reason it was introduced, fill time and have the three suits for the actors they were missing do it helped well. In the long run yes it is pointless but it fixed a production problem at the time, of missing half the cast. Oh, that's why they did it? I did not know that. 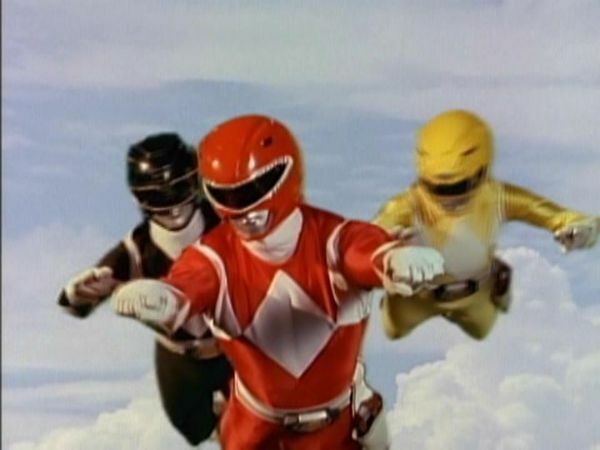 The scene that showed the rangers "jetting" was honestly one of the most unintentionally hilarious power rangers scenes I think I've ever watched. I didn't get the point of it at all. But it did make for a good laugh. I also thought it was funny how Bulk and Skull mentioned it later on. But how did these two even know what it was called in the first place? Jetting was one of the many silly aspects of the first couple power rangers seasons imo. But did they sell a Jetting toy? I'm not well-versed in the merchandise. No, they didn't. Furthermore, I don't see how they could in a way that would justify featuring it on the show. How would a "jetting" figure be any different from a normal figure held horizontal in the air? The most you could do with it would be a Happy-Meal-style toy with a stand for the inarticulate Ranger figures in a "jetting" pose. That's what makes it so bizarre: You can't use the "to sell toys" excuse because there was no toy to be sold. I only saw one picture of red, black, and yellow flying "First superman movie style".